Cellphone broken and then signed by Rihanna goes for $66,500 on eBay. 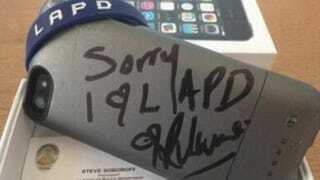 Rihanna's wristband caused a chain reaction that raised over $80,000 for the Los Angeles Police Department. Last week at a Los Angeles Clippers game, the pop princess, who was wearing an LAPD wristband, just happened to be seated next to Los Angeles Police Commission President Steve Soboroff, who of course wanted to take a selfie with the “Pour It Up” singer, the New York Daily News reports. Rihanna somehow accidentally dropped the phone, cracking the screen. An apologetic Rihanna signed the phone, "Sorry I (heart) the LAPD," and then donated a cool $25,000 to the police department, the Daily News reports. After the breaking of the phone became news, Soboroff decided to cash in on the phone's newfound celebrity and auctioned the cracked iPhone on eBay. And this past week someone forked over $66,500 to own a piece of LAPD and pop-music history. According to the auction listing: "Half of the money raised will go towards the LAPD Cadet program crisis. The other half of the money will go towards the Los Angeles Police Memorial Foundation, to support the families of fallen officers. We have tragically lost five officers since March 7, 2014."